Alex’s Wake is a tale of two parallel journeys undertaken seven decades apart. In the spring of 1939, Alex and Helmut Goldschmidt were two of more than 900 Jewish refugees fleeing Nazi Germany aboard the St. Louis, “the saddest ship afloat” (New York Times). Turned away from Cuba, the United States, and Canada, the St. Louis returned to Europe, a stark symbol of the world’s indifference to the gathering Holocaust. The Goldschmidts disembarked in France, where they spent the next three years in six different camps before being shipped to their deaths in Auschwitz.In the spring of 2011, Alex’s grandson, Martin Goldsmith, followed in his relatives’ footsteps on a six-week journey of remembrance and hope, an irrational quest to reverse their fate and bring himself peace. 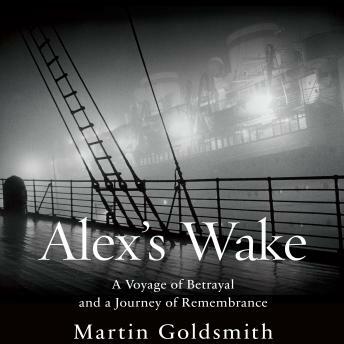 Alex’s Wake movingly recounts the detailed histories of the two journeys, the witnesses Martin encounters for whom the events of the past are a vivid part of a living present, and an intimate, honest attempt to overcome a tormented family legacy.